Location: Main Index » Forum Index » Automotive General » Paint and BodyWork » rattle can primer. I plan on sanding off surface rust on my van roof. I probably will do this over a period of weeks. I don't want to get out the spray gun each time. I would like to use a rattle can metal etching primer. All I hear is bad things about rattle can poor quality paint. Is there a product that is good and I can get in Calif. The Democrat government here has ruined many products by altering the formula or removing them from the market. The Democrat government here has ruined many products by altering the formula or removing them from the market. The "other government" doesn't give a rats patoot what gets put it the air, water, or food. Yes, but you have go to an automotive supply paint store. Talk to them about what you want to do. There are many in Orange County. Edited by BigDogSS on 10-29-18 08:24 AM. Reason for edit: No reason given. Tommy. You should come out here and live under that government who does give a .... about what goes into air and food. See regulations, taxes and many other thing that they jack up and eliminate or restrict. Thanks Big Dog. Didn't know about that one. Used to shop at Betz in Orange but they are gone. The one by my place is somewhat helpful but can't get any real helpful info from them. Just called them and they said they do have a rattle can metal etching primer. We'll see. Thanks again. Edited by J C on 10-30-18 10:26 AM. Reason for edit: No reason given. I use this product for small jobs. 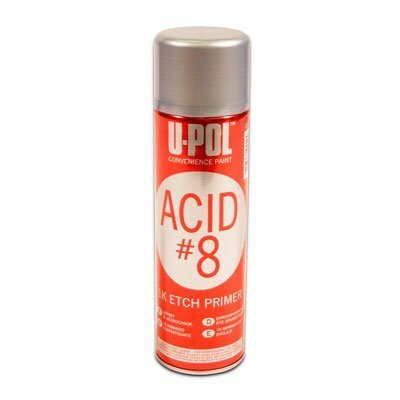 You can use it to hold you over until a more permanent solution is found or until you can get it done with an actual two part epoxy primer. I went to where I am buying my paint with this same problem. They handed me a can and said use this and you will have no issue with any of our paint. Their basic advice was know what type of paint you plan to use in the end and they will match it with a comparable rattle can. The other advice I was given is that I only need a real light coat to stop the rust. Any one part rattle can primer is not going to be a good foundation for a paint job. If you must use it, make it a temporary thing and be prepared to remove it prior to the real paint job.